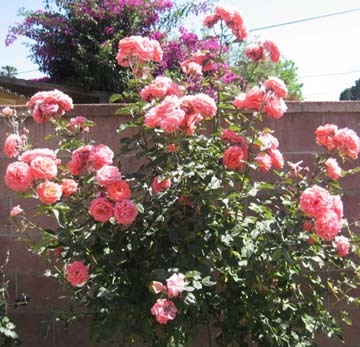 This year, Mother’s Day started the friday before, around 6:30p.m. From my post at the kitchen sink, scrubbing dried ketchup from T’s food tray, I watched my dearly beloved pull up and extract a huge white cage from the passenger side of the car. I slid back the kitchen window so hard it banged. WHAT DID YOU DO! I shouted quite rudely. I’ve had some experiences with birds. More than one wild house finch has required my rescuing services, the last one just a week ago, when I pulled a youngster from Al’s mouth and T and I rushed it to the Wildlife Waystation in Calabasas. One wing was tweaked, I think tweaked before Al’s mouth tasted it, which is why he was able to catch the finch at all, because when you look like THIS, you don’t move very bird-catcher-cat nimbly. Mostly you lie around licking your large pink belly, when you’re an Al. Back when I was a single woman in Los Feliz, I opened my security gate one morning and there he was, Mr. Peabody, my new love, collapsed on the ground at my feet. I rushed him inside, revived him with drops of tap water on his beak and popped him in a cage I had from saving a wild finch who’s leg had been damaged by a pop-up sprinkler and who I’d nursed back to health. In went Mr. Peabody for 3 or 4 years. He died right before I moved in with my (then fiancee) husband, destroying me. I kept him in a small box in our freezer for two years (yes, creepy shades of “A Rose For Emily”), until we moved here, to the Ponderosa, and I was able to give Mr. P a proper burial in our back yard. WHAT DID YOU—oh whatever. Givehimtome, givehimtome, givehimtome now. 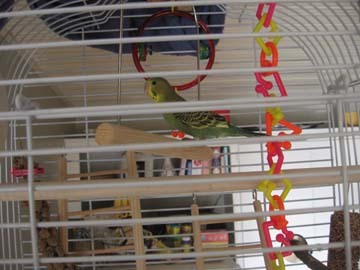 Regardless of his whole frozen bird complex, S obviously took to heart how much I miss Mr. Peabody and so he got me Julian for Mother’s Day: a very young, green parakeet I plan on taming and giving free-fly time around here. 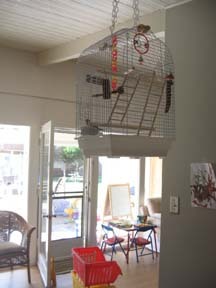 We’ve hung his cage up extremely high (meaning away from cats) and in a central location, so he can see us coming and going, hear us, hear the TV, the birds outside, can be in on all the wild action in these parts. So for once I didn’t save a bird, but was given a bird and it’s such a different feeling. Part of me feels, well, rude: Oh god–another animal to feed, water and worry about, NO NO NO!!! But that panic passes when I watch Julian explore his food bowl by plopping down in it, or tussle with a rock-hard piece of bagel, or when he emits those cheerful chirps and delights my son. I’m glad he’s here. I look forward to coaxing him onto my finger one of these days, when he decides I’m worth trusting. Welcome to the Ponderosa, baby bird. Just—live a long time, okay? And prosper. This entry was posted on Friday, May 14th, 2010 at 17:33 and is filed under ANIMAL DRAMA!, BABY BABY, Ponderosa, Vitals. You can follow any responses to this entry through the RSS 2.0 feed. You can skip to the end and leave a response. Pinging is currently not allowed. Wow, the Baby Bird actually does look a bit like Julian Lennon! My sister Marnie would be sooo jealous!! !